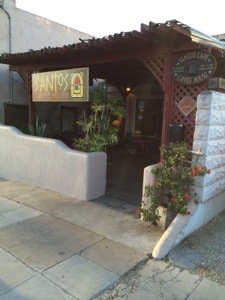 I’m at Santos Coffee House in North Park this morning. 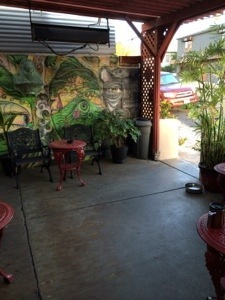 It is easy to find for San Diego’s craft beer enthusiasts since it is basically right across the street from the Thorn St. Brewery. Santos has their regular roasts plus some that rotate each day. I try to come on Mondays since that is when they have the French from which Nicole makes my double hammerhead. The have a nice selection of pastries but I usually get one of their quiches. Today I chose a sun-dried tomato and goat cheese and I’ve also had their sausage and Parmesan and the spinach and feta. All are quite good. I’m only here every few weeks or so but there are several regulars who are here most everyday. Bob J comes to mind since his forebears are Welsh as are a pair mine. He is also fond of cigars so occasionally outside on the patio there is the mild aroma of a lovely Dominican smoldering. This is an additional treat since I try to limit myself to about two cigars a week and usually on the weekend. There is plenty of indoor seating and there are usually three or four people lingering there as the “to-go” crowd comes and goes. Usually also, there are three or four dogs that come by with their owners and happily greet the outdoor guys. Competition. I think I can write a whole book on this and some day I probably will, or at least a few chapters. We have evolved as a competitive species. Again, I’ve made a statement of the obvious, since ALL species are competitive. It is easy to test the validity of that statement. Just try blocking the sun out on one side of a plant and watch it grow towards the sunny side. It is why the trees of a dense forest grow so tall, they are in a race(competition) with each other for the sunshine. Starve your dog (I don’t really mean that) and he will probably eat your leather shoes (and eventually look at you and start to drool). It all started with a very simple organism which figured out a far easier method to gain the chemicals that it needed. No longer did it have to go around randomly sampling the environment searching for just the right building blocks needed to thrive and reproduce. All of those building blocks were already locked away in neat little bite size packets. Those packets are called “other life forms”. And here we are today trying to make our yard look nicer than the neighbor’s and striving for our high school team to out compete the one across town. Of course it does not stop there. We are driven to competition for a mate, status, place in the company and finally for our country to achieve a higher standard of living than all the others. Nature got us this far but nature’s competitive drive knows no bounds. There is no concept of “dirty pool” in nature nor of murder or theft. It is a system of ultimate competition. In moving our civilization away from pure nature we’ve made some basic rules about things such as murder and theft and that is a step. Where did they set their limit of competition? Or even better, Did they evolve beyond the need for competition? This last one is because a small but growing voice in the basement of my mind is telling me that there can be no lasting peace or continued advancement if individuals or groups are chosen for subjugation.